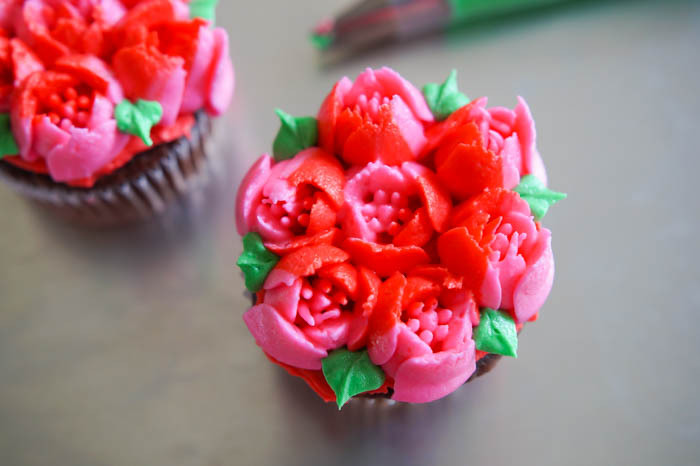 With all of the Russian talk in the news, wouldn't it be great if it was all about frosting cupcakes? 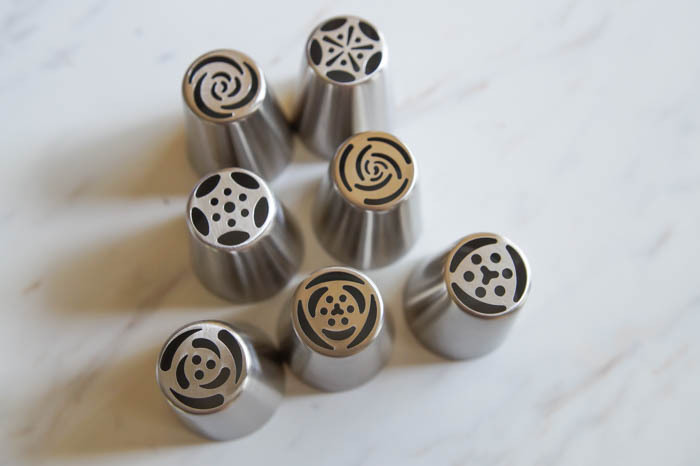 I'd seen Russian piping tips all over the internets, bought a set about 6 months ago, and promptly forgot about them. If you're like me and have a set buried in a kitchen drawer or you've been curious about them, here's the honest, beginner's guide to using them. 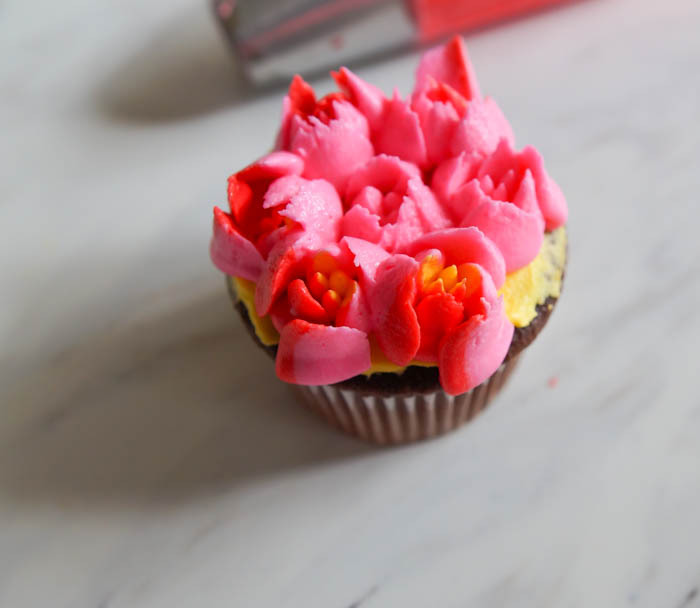 If you haven't seen Russian icing tips, there are many variations. Most come in a set with several tips. 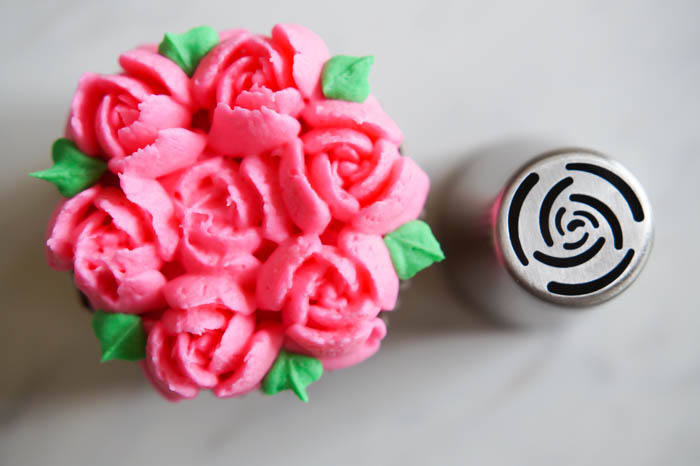 The idea is that the tip is so intricate, you can pipe a rose or another flower in one fell swoop. They were not as simple to use as I'd hoped. The key for me was frustration. 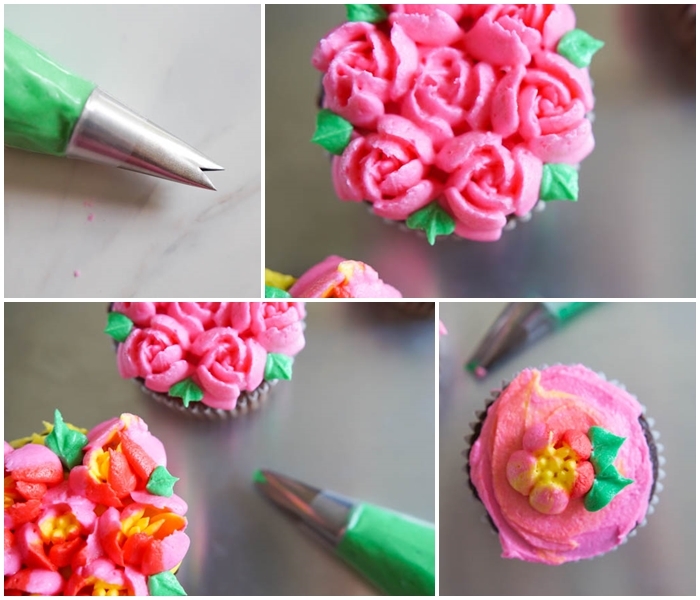 The more frustrated and angry (yes, angry at a frosting tip), the prettier my piping became. 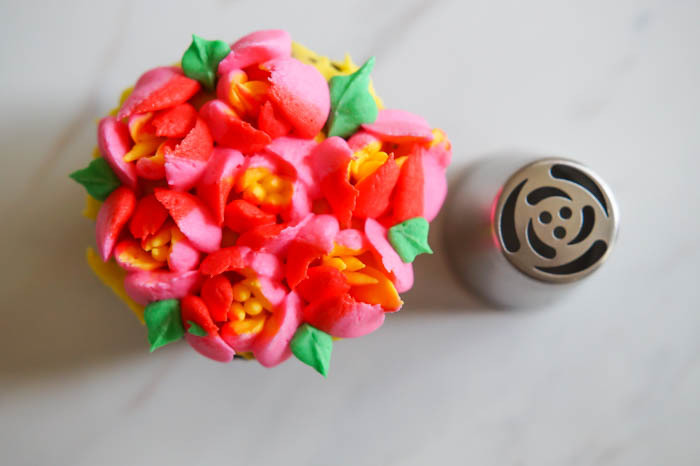 You'll need a stiff buttercream. If you think your buttercream is thick enough, go ahead and stir in more sifted powdered sugar. You should be able to caulk your shower with it. THICK. 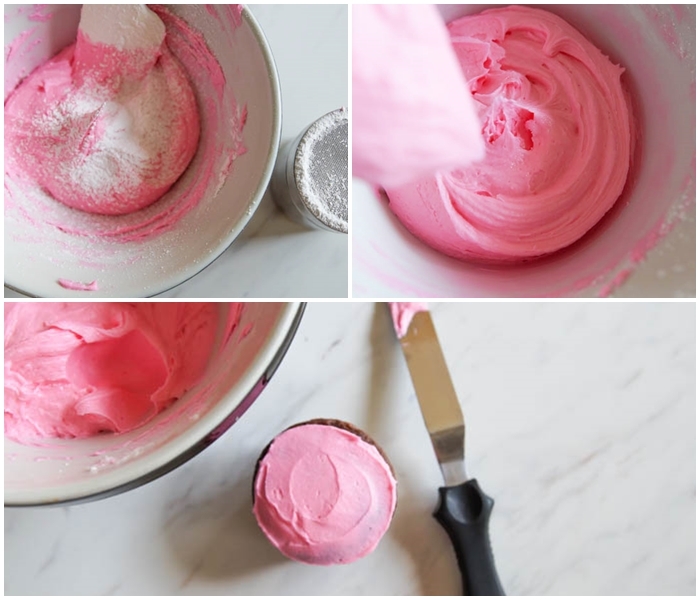 To start, spread a thin layer of frosting onto the cupcake with an offset spatula. This will help the piped flowers stick...and it also creates a prettier surface. 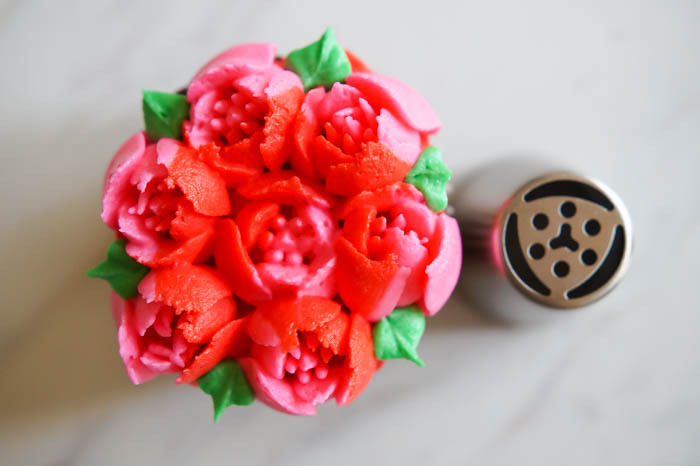 Begin piping in the center with one flower. Then go around the edges. 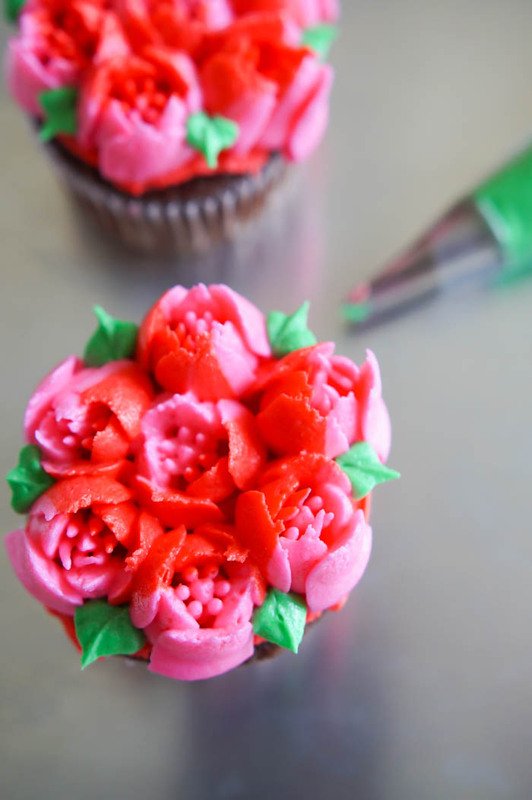 Squeeze the piping bag and pull up in a quick burst, releasing the pressure. Shorter flowers are better. When I talked about frustration helping, I was not releasing the pressure quickly or abruptly enough. As I would get frustrated and pipe in short bursts (while muttering under my breath, "why. aren't. you. working. "), the flowers were prettier. 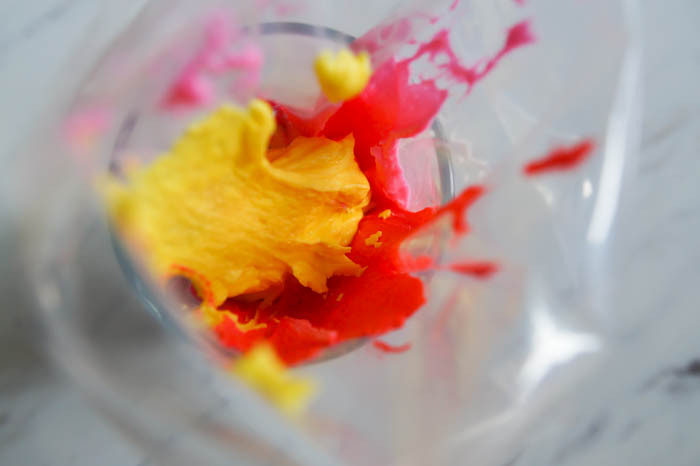 Using multiple colors in one pastry bag looks really pretty. 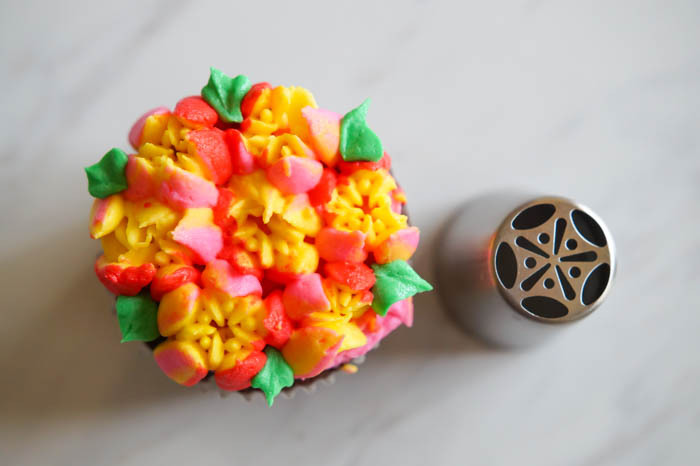 I added pink and red along the sides of my piping bag and yellow down the center. You can see that the pink made it to the bottom of the bag first, but as I piped, the other colors emerged. 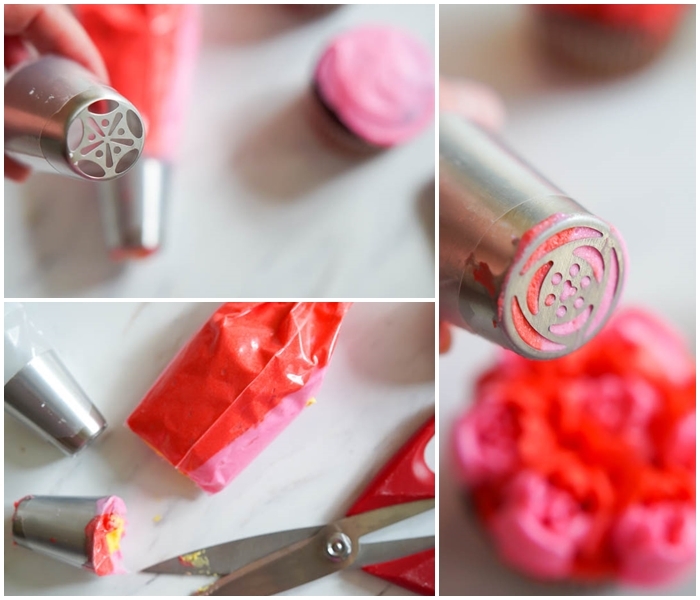 Be sure to use 16" piping bags instead of the smaller ones. 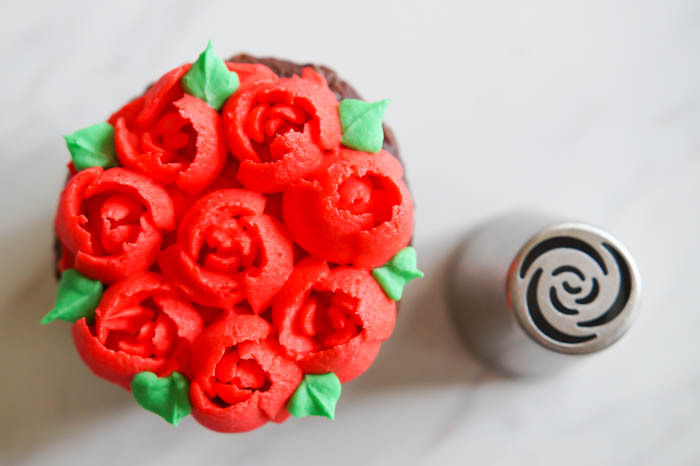 You'll go through a lot of frosting and won't want to constantly be refilling. On that note, if you like the frosting mixture in your bag, but want to change tips (and you don't have a large coupler), here's what you can do. 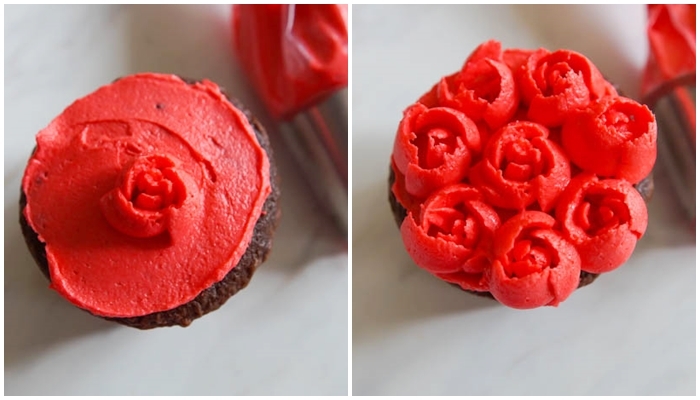 Place the new tip inside a fresh piping bag. Cut the bag you're using just above the tip. Place the bag filled with frosting inside the new bag. Voila! I love the idea of adding leaves to the flowers. Leaves fill in any gaps and are just the right finishing touch. Here are the tips I used for each flower variation. This was one of my favorites....maybe it's the combo of pink and red. The truth is, I might use these now and again, but not on a regular basis. (Maybe only when I need to work out some frustrations.) ;) I also won't try to use ALL of the variations on one batch of cupcakes. 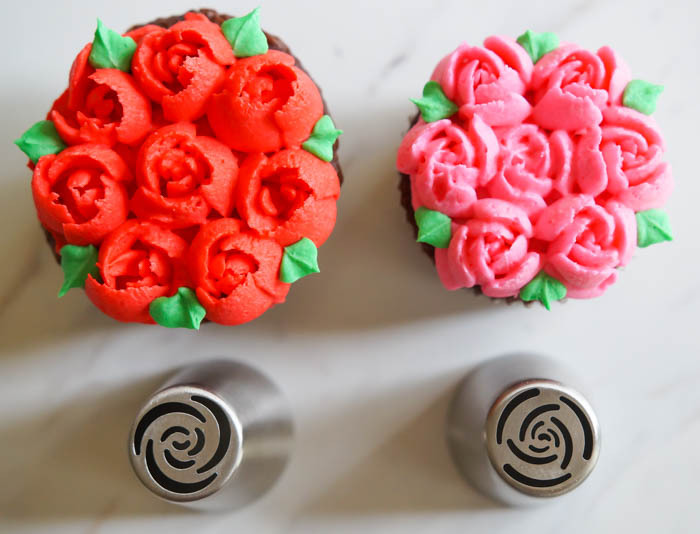 Have you given Russian piping tips a try? I'd love to hear your thoughts! How weird is this?? 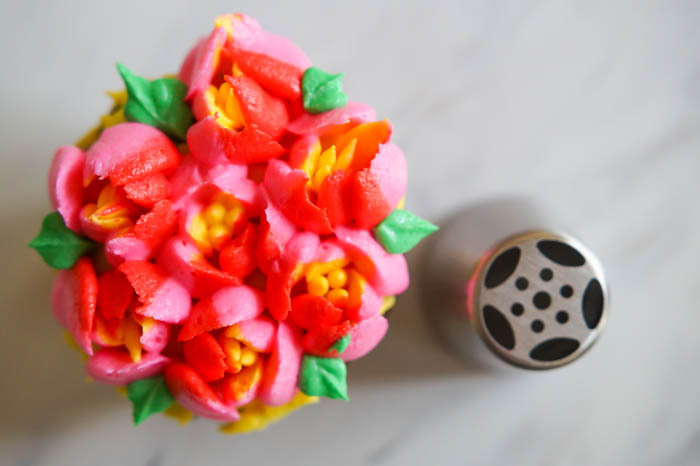 I received your email regarding the Russian tips while I was watching Montreal Confections Youtube video on how to decorate a doll cake with Russian piping tips! Anyway . 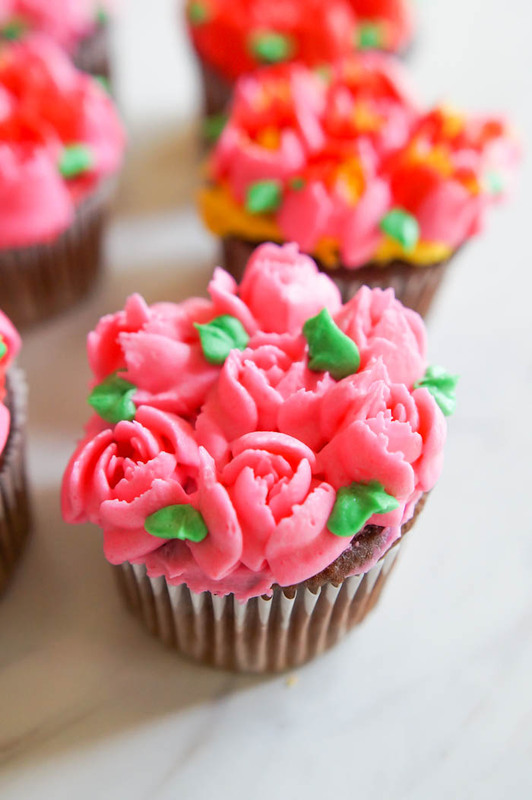 . . your cupcakes look gorgeous! Perfect timing! I just yesterday ordered a set of Russian tips (the set also includes the spheres) and now here you are with an excellent tutorial! I'll let you know how things go - have a feeling I'll be making a lot of practice flowers! These have beautiful results but I am leary of trying them for fear of being investigated for collusion! Yep bought myself a set of 24 (along with the large coupler) and they have been sitting in the drawer ever since they arrived. After reading your tutorial, I'll be expecting frustration to set in. :) I have a bake sale coming up so I guess I'd better get my practice in before making the cupcakes for the sale. Too bad these wouldn't work well on sugar cookies. Great tips (no pun intended)! I especially like the "able to caulk your shower with it" guideline! LOL! And now I think I need a set of these tips. thanks for sharing this post here!! You have got remarkable stuff at this point. That is to say, you make the best one. You should keep publishing more articles for Best News Apps and you will Such Become One of the best writers ever.